The "Three Buddha's" hot spring in Garlach, Nevada. Photo provided by Chuanlun Zhang and the Nevada hot spring team. "Alkalithermophilic Chemolithoautotrophic Crenarchaeota" is a mouthful to say, but it precisely describes the new types of microbes being sought by Drs. Chuanlun Zhang, Christopher Romanek, Gary Mills, and Juergen Wiegel of the University of Georgia. Crenarchaeota are members of a poorly surveyed grouped of microorganisms in the domain Archaea. These investigators will focus on alkalithermophilic Crenarchaeota—those that both grow at or above pH 8 and at or above 60 degrees C. Most of the known thermophilic Crenarchaeota have been found in low pH environments, while more alkaline habitats such as these have received less attention. Numerous hot springs located in the Sierra Nevada are alkaline and may provide unique niches for Crenarchaeota. Elucidating the ecological functions, and biogeochemical consequences of CO2 fixation carried out by these organisms. Comparing results from this study to those of hot springs in other habitats with different geochemical profiles, such as Yellowstone National Park (USA) and the Uzon Caldera (Russia), in order to better understand the evolutionary pathways taken by similar organisms from diverse environments. Collaborative efforts of those involved in the study will be directed towards training graduate and undergraduate students with the interdisciplinary skills useful in solving complex biogeochemical problems of the near future. 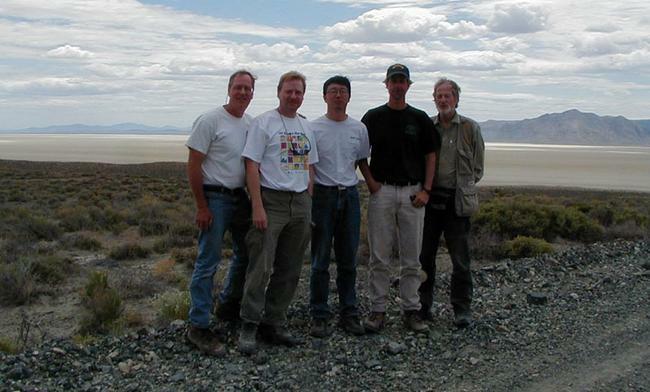 The Nevada field crew, from left: Gary Mills (UGA), Rick Socki (NASA), Chuanlun Zhang, Chris Romanek, and Juergen Wiegel (all UGA) shown in the expansive Nevada landscape. 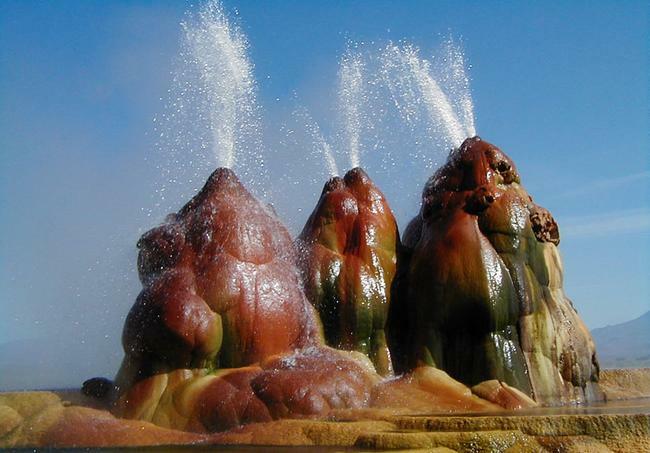 Photo provided by Chuanlun Zhang and the Nevada hot spring team. Gary Mills, Organic Biogeochemistry - Dr. Mill's research focuses on the processes controlling the transport and transformations of natural and anthropogenic organic compounds in aquatic and terrestrial environments. Chuanlun Zhang, Geo-microbiology - Dr. Zhang's research interests are in geo-microbiology and environmental microbiology using an integrated approach of molecular microbiology, microbial lipid biomarkers and stable isotopes, microbial isolation and culturing, and mineralogical tools. Chris Romanek, Stable Isotope Biogeochemistry - Dr. Romanek's research specialty is low temperature and aqueous geochemistry with emphasis on the stable isotope systematics of elements that play key roles in biogeochemical processes. Juergen Wiegel, Microbiology and Physiology - Dr. Wiegel's research has two major focuses. 1. Anaerobic thermophiles: Ongoing research includes the isolation and classification of new strains exhibiting special features of industrial or academic interest. 2. Anaerobic degradation of chlorinated aromatic compounds: Our research focuses on the sequential degradation of chlorinated phenols and polychlorinated biphenyls (PCBs) by anaerobes in mesobiotic sediments from polluted sources. Copyright on all images and material by Zhang and the Nevada hot spring team, 2005.